This is a poster I've just finished. 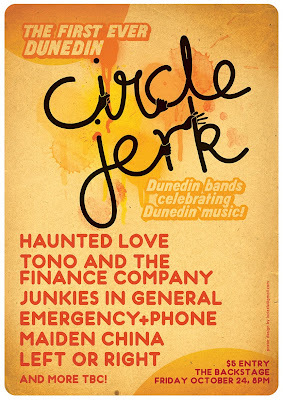 It's for a Circle Jerk show where a number of local bands play covers of local music. Sahweet! Covers are one of my favourite things! It should be a rocking night so if you're in town on Friday the 24th of October, pencil this puppy into your diary as it should make for an entertaining evening. I've been fairly stoked to make a decent number of posters this year. I love the format and like seeing what I can do. Sometimes I want to make things smaller and more subtle, but generally the feedback I receive is to "make it bigger" so I almost automatically do so these days. One day... one day I'll make posters that have the details small, as an almost afterthought and it'll be the image and the headlining band that'll take up the majority of space. The way things ought to be. ha, I like the title font.